When Torontonians hear of the Annex, a few descriptions come to mind: Academic prestige, affluence and an inspiration for creativity. The Annex is best-known for its charming Victorian homes, which house everyone from students to small families. The U of T, the Royal Conservatory and Varsity Stadium are just steps away – making this area one of the most cultured and vibrant in the city. Avonlea Renovations knows the Annex all too well. If you’re looking for a living room that features a vast view of the university campus, call Avonlea. 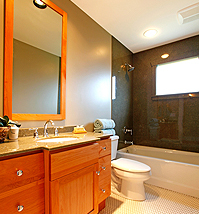 Or maybe you’d like to change up that old tiling and shower stall in your master bath? Avonlea’s extensive showroom can help you do just that. At Avonlea, we know our clients want personalized attention. What works in one home may not suit the needs of yours. That’s why all of our suggested designs, colours and layouts are created just for you. And we know that shopping for cabinetry and backsplash tiles in our showroom is tons of fun. But not-so-fun is dealing with all the plumbing and electrical. Let Avonlea be your one-stop shop. We’ll deal with all the technical stuff, so you can enjoy the finer aspects of home renovation!